We know that the last thing you want to do in summer is skate, skate, skate. We hear you loud and clear. 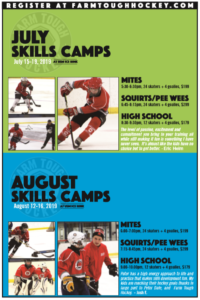 We have put together an incredible program for both Goalies and Skaters that is guaranteed to get you better, all while having a blast! For over 20 years I have been teaching players for all over the world how to get better, gain confidence and learn “how to train!” I believe that my job as a trainer is to give you the tools to be able to become self-aware of your strengths and weaknesses so that you may better understand how and where you need to improve! The ability to look at yourself, honestly and realistically, is a key characteristic that will help in every area of your life! WHY IS OUR CAMP DIFFERENT? WE TRAIN AT GAME PACE! “I have learned more from Peter Dale than with any previous hockey instructor. 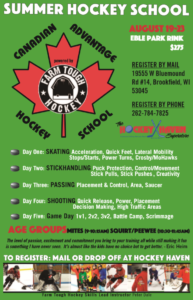 Peter’s Farm Tough Program incorporates components of strength, balance, and hockey skills. What a difference! I highly recommend Peter Dale”. ALL shooting and stick skills using the Power Edge Pro for Players. Specific goalie progressions to develop skills and develop better game awareness. Camp Location: University School of Milwaukee, 2100 W Fairy Chasm Road, Milwaukee WI 53217. ALL sessions are geared towards small group training. This will allow for immediate feedback and improvement. Make sure to register early to reserve your spot! Indicate Players Name and Birth Year. You will get a follow-up confirmation email with availability and payment instructions! TRAIN ON THE POWER EDGE PRO: The Power Edge Pro is the leading on ice training tool in Canada. Training on the Power Edge Pro provides resistance training for athletes at game pace. Combines individual skills in small areas with decision-making abilities to provide additional pressure on the player. These skills transfer to real game situations!